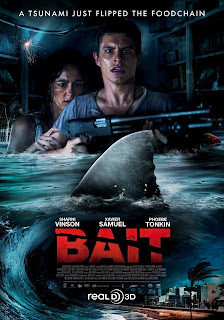 Tag line: "The food chain just got flipped"
Bait, a 2012 Australian import, has a few things in common with another recent film, 2011’s Shark Night. Aside from the fact both were originally presented in 3D, they tell a similar story about a group of people being hunted by killer sharks. But this is where the similarities end, because while Shark Night toned down the violence in order to attract a younger audience, Bait lets the blood flow freely, and allows the occasional severed head to float into frame. A small beachside community is ravaged by a freak tsunami, and, as a result, several people are trapped inside a flooded supermarket. But while they were lucky enough to survive the disaster, these unfortunate few have a whole new problem to contend with: a pair of enormous great white sharks, which are loose in the store and hungry for some fresh meat. Once the sharks are through gobbling up those killed by the tsunami, they turn their attention to the survivors, who are working diligently to find a way out of their dangerous predicament. It’s a great set-up, and Bait does a fairly good job telling its story, complimenting the gory attacks with a few genuinely suspenseful moments. Along with those inside the supermarket, three people are also trapped in an adjacent parking garage, sitting patiently in their submerged vehicles waiting for help to arrive. Two of them, Kyle (Lincoln Lewis) and his girlfriend Heather (Cariba Heine), inadvertently draw the attention of a shark, causing the creature to try and break their car’s windows. Yet while the tension in Bait certainly rises whenever the sharks are on the prowl for food, it’s nothing compared to what happens when they finally catch some. In one scene, a guy falls into the water and quickly tries to climb back out. Jaimie (Phoebe Tonkin), a teenage girl trapped inside the store with her policeman father (Martin Sacks), grabs the guy's arm to help him. It’s at this point a shark attacks. Soon, Jaimie is holding nothing but a severed limb, and watching as the rest of his body slowly drifts away. 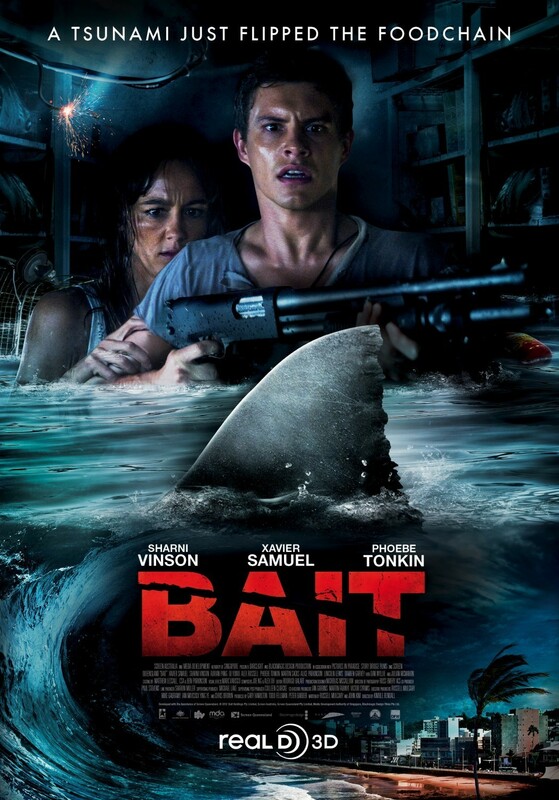 Of course, Bait does suffer from the same malady that infects a slew of recent genre films: poor CGI effects. The scene where the tsunami crashes onto the beach isn’t the least bit convincing, and some of the shark attacks result in a cloud of computer-generated blood that’s equally as unimpressive. Luckily, Bait is able to overcome these issues, weaving an intense tale of survival around an interesting concept, and doing some pretty nifty things with it in the process.